Any of you guys are experiencing with issue using "Commands are Menus" in Custom Tabs? I got few tabs as "Data List" but unfortunately cannot use Right Click function because when I check "Commands are Menus" and choose the command\script it doesn't run! BUT the same commands\scripts run well through the Bar. I tried to uninstall the custom tab and reinstall it with no chance. Any one can please tell me how doe's it work with him? Any thought what am I doing wrong? edit*: What should i do exactly? I hadn't tried this before but did just now and it doesn't seem to be working for me either. p.s. im envious of your tabs there, any plans to share some day? Yes sure, I can share everything you want , or if anyone asks. This one runs script to check the version of Windows Update Agent if older than the one in Microsoft, it will download the new one and apply it. Please find it attached "Check and Update WUA.zip"
Anyone can easily update the attached script by changing the %powershellresult% check to the mentioned versions, then replacing the download link for each KB as provided in this Edit. regarding to the OS Version. If you find it is hard to edit the script please let me know. Anyways if we write something wrong (letters, spaces, not a correct ID, etc .) log message in Script tab will tell us that. Then it will bring the Windows update related to this KB, and try to push it through LT update to the target. Please find it attached "Install [KBID].zip"
Please find it attached "Uninstall [KBID].zip"
Resetting Windows Update components can be a solution for common Windows Update errors. •	All 12 steps as Microsoft provided here: https://support.microsoft.com/en-us/kb/971058 includes the last 2 steps to install the last WUA (here it runs our script to check and update WUA) then restart the computer. So, please note that the computer will restart after pushing this button and finish its job to get 100% of the results. Find it attached "Reset Windows Update Components.zip"
I'm sorry, I don't know if I can attach this one because it is huge one, this button is one main script (157 lines) calls about 20 child scripts after knowing the error code that you provide as parameter. If @Error_Code@ = 8000641213 (which is wrong, or it is not listed in main script as an error code) , the script will go to :Not_Listed - Label, which sends email to LTuser who has ran this script, and to me. That will help me to update the script and search for the unlisted error codes later. Then i run the LT Script functions: "Virus Definition Update" and "Virus Scan: %systemdrive%"
It all fails if "AV Exclude" is installed on that computer, so this example has 2 different emails, one to inform about the process as all previous emails, second if "AV Exclude" found, so no update nor scan will be run automatically because it is a dummy AV. 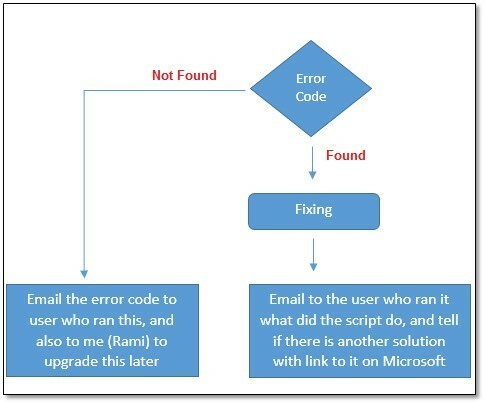 - I would prefer to add: "If computer needs reboot" then exit script (by checking Need Reboot flag), because as you know few of WU errors can be solved after restart. This is great work Rami! I'll get it set up and see if I can contribute in any way, thanks a lot! Actually, I have few (cool) custom tabs, but I feel like they are incomplete without commands are menus function .. I hope @Greg will fix that. How do you have the Install [KB] and Uninstall [KB] buttons configured? I'm frying my brain trying to figure that part out. I can't believe I missed that when crawling through the main post! Thanks rami! Rami, this looks great. I tried using the sql posted but they did not work. Do you mind exporting your tab setup and attaching it to a post? We have been struggling with Windows 7 Patches for sometime due the Windows Update Agent, your script to get update the windows update agent worked a treat thank you. We have been struggling with Windows 7 Patches for sometime due the Windows Update Agent, your script to get the update agent worked a treat thank you. Thank you BIT, happy to hear that.